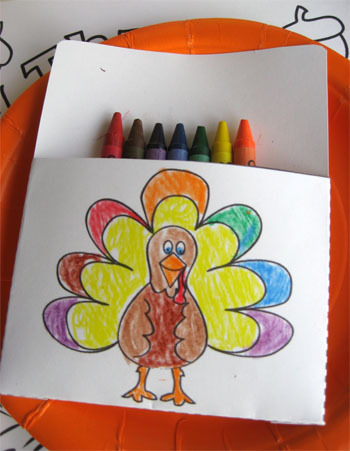 Let your children color their way to a festive Thanksgiving table. 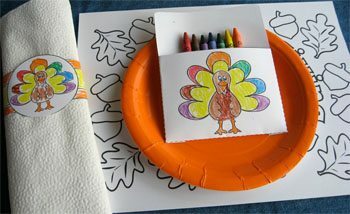 Grab some crayons and colored pencils, print off the downloads and your kids can decorate their own table. Start with a colorful turkey for the centerpiece. Print two turkeys, color and cut-out. On the backs of the turkeys, place glue stick at top of each wing only. Stick the two turkeys together. Once turkey is dry place it over a small drinking cup. For the napkin ring, print on cardstock and color. Cut out and fasten with glue stick. This crayon holder is a quick and simple way to keep crayons together. Print download on cardstock, cut on solid lines, fold on dotted lines. Fold bottom up and the tabs to the back. Glue tabs with glue stick. Don’t forget the coloring sheet to be used as a place mat. 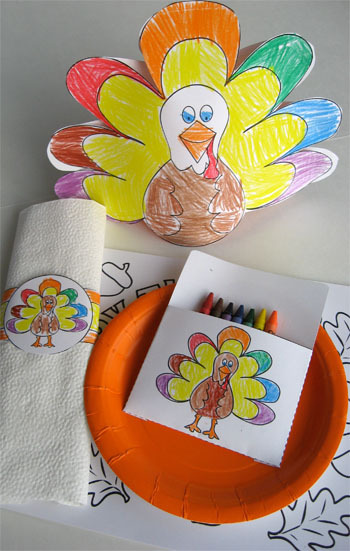 Use butcher paper for the table cloth and the kids have even more room for coloring. Very cute – I think I’ll link to this from our Econobusters.com site tomorrow–Thanks! Editor: why thank you! This is the nicest thing we have read all day. .
Love this! Perfect for my little ones and their cousins for Thanksgiving! Thank you! What a treat for the kids’ table! Thanks so much for sharing. Thank you! I am going to post a link on my blog to this post! Wonderful ideas!!! This is such a great idea, even for kids who sit at the adult table, like mine do. That way they will be entertained while the rest of the table talks and talks and talks. Printing them out right now! Thanks so much! This will be perfect for the kids at our Thanksgiving. Thanks so much for this file!!! Awesome! my Mom was a big fan of this – usually she skipped the printouts (she wasn’t organized enough to get to it, and we were never big fans anyway) and used a nice disposable tablecloth – the kind made of heavy paper that feels like cloth. It was also great for birthday parties – whoever arrived early sat at the table and decorated their spot while waiting for everyone to arrive. 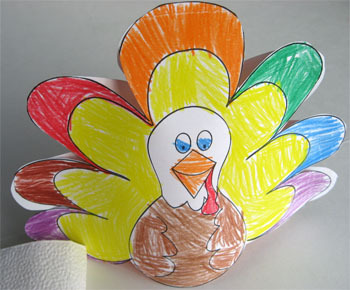 This is so cute, my 6 yr old will just love doing this as a Thanksgiving Day craft for the family. Thanks so much for sharing! I love it and am going to use it! Well, this is just too darn cute! Thanks so much for this–I am planning on doing this for both sides of the family–the kids will love it! So very cute! Just what I needed to spruce up the kids table this year! About to link this up at our blog! Such a cute idea and perfect for our little turkies! Great post! We ReTweeted this and posted it on Facebook! Hi there- I used your printables for a service activity for our in home preschool. My preschool kids were sent home with a copy of the place mat and a list of service activities, with instructions to color in one acorn or leaf each time they do service. Thanks for the great activity! We’ll be using the rest of the printables on Thanksgiving day. Thanks so much for these! They are adorable, and exactly what I was looking for – my kids will LOVE them! I also wanted to let you know that I linked to this post from my piano studio website. We’re using the place mat as a practice tracker this week! What an awesome idea. I’m going to change the ink in our printer this afternoon so I can print some for my kids! Thanks! soooooo super cute 🙂 do you by any chance have a pattern already set up for Christmas????? 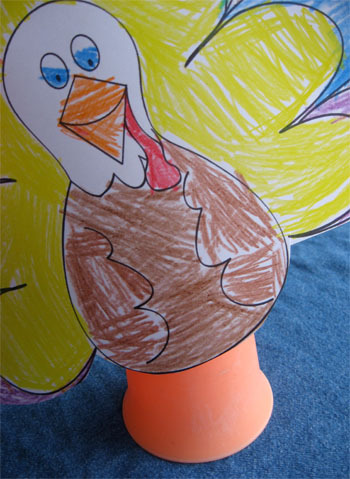 Absolutely love the Thanksgiving printables for kids. We will definitely be using them this year! Thanks for sharing! So cute! I’m going to use it this year. 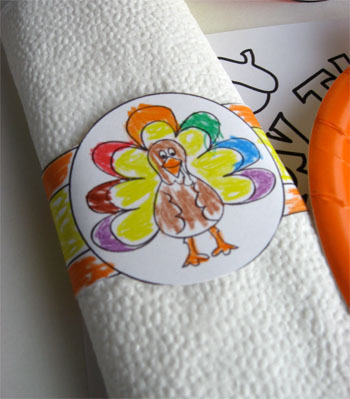 The kids will be so excited they get to decorate their own place settings! Do you have this for Christmas?